To say that Andy Baker has seen and done it all in the beer industry in Hawaii wouldn’t be a stretch. Sales for a large distributor, check. Marketing, check. Brewery owner, check. Craft beer evangelist, check. He loves everything about beer and has been incredibly influential in the growth of craft beer in the state. The past 2 years have been tough dealing with the downfall and bankruptcy of Hawaii Nui and Mehana Brewing, but that is now behind him and he has recently joined Aloha Beer to help relaunch the brand. Like a true marketer, when I met up with him to grab a photo he made sure he had a six pack of Aloha Lager. I was born in Colchester, England and grew up in the East Anglia region of the country about 25 miles from the home of the Greene King brewery. Most of the pubs in our area of the country were owned by the brewery during the sixties and seventies, so I was very familiar with the brand name and company at an early age. I moved to America in 1977 and in 1979 to Hawaii with my parents who were looking for a warmer climate. I’ve remained here ever since. How did you first get interested in beer? Do you remember the first beer that really left an impression on you? Like many young impressionable folk I started my beer journey with the mass-produced, “hyper-marketed” brands. Back in the early eighties you were really the “hip” consumer in Hawaii if you showed up with a 6-pack of St Pauli Girl. However, in 1983 my beer world really opened for me during a trip back to England when my Grandfather introduced me to“cask-conditioned” ales. The fact that I could legally have a beer in the village pub was not lost on him and he made sure that I had a really good beer. I don’t recall what brand it was but since it was a Greene King Pub, I’m sure it was one of their beers. To this day I love their Strong Suffolk (Olde Suffolk here in the US). How did you get started working in the beer industry in Hawaii? In 1983 I hooked up with the Miller Brewing distributor (McKesson) and put on keg parties and special events at Windward Community College. In 1985 I accepted a position in the Advertising and Promotions Department at Eagle Distributors – the Anheuser-Busch distributor at the time. What different jobs/positions did you hold at Eagle Distributors? I started as the Budweiser Campus Rep at the University of Hawaii at Manoa getting paid a wopping $170 per month to hang out at Manoa Garden and Johnson Hall to find out when the parties were and make sure they served Bud. Since I really wanted to get my foot in the door, I put my all into the job and didn’t take any other part-time jobs. I think I’m still paying for it to this day – my version of college debt. I did manage to move up in the ranks of the re-named Marketing Department until I was I became the department Manager underneath the Director. At this point I was encouraged to move into the sales department – so that I could at least gain the experience of running a sales route. In a short period of time I ran sales routes in parts of Kalihi, Waipahu, Waianae, Nanakuli, the Northshore, Windward Coast and the military. This was a great way to learn the sales side of the business, particularly at a time when the portfolio was expanding from one that was strictly A-B to one that included Boston Beer Company, Sierra Nevada, Full Sail and Red Hook. Finally, I was able to utilize my interest in craft beers in a professional environment. In 1996 Anheuser-Busch purchased Eagle Distributors and ran the operation as company owned distributorship (WOD). Since I had street sales experience, I was appointed Director of Marketing to manage the department, personnel and operations. However the corporate world of A-B was not to my liking and I left after only 6 months and formed the RAMP Group with my wife, Ruth, to handle marketing and Public Relations for craft brands doing business in Hawaii. In May of this year, the RAMP Group will have been operating for 17 years with mostly craft beer clients and business. What was Hawaii’s beer scene like in the late 80’s and 90’s? What craft or imports were available? Heineken, Corona and Steinlager were the big imports of the day. Steinlager was a huge draught brand and was very competitive with Budweiser at the time. The first craft/import craft brands that you saw in the late eighties were Samuel Smiths Old Brewery Pale Ale, Pilsner Uquel and Steam Beer from Anchor Brewing. By the mid-nineties, Pyramid was doing very well here. along with Sam Adams and Red Hook. With the demise of Eagle Distributors in 1996 many of the non A-B brands went over to Paradise Beverages, including Kona Brewing and as they say the rest is history. All of those brands have experienced amazing growth since. What lead you to getting into the brewing business and owning a brewery? In 2000 I joined Kona Brewing as the Director of Sales and Marketing. This was a great experience as I finally got to work on the management and growth of one brand family. Everything that I did on a daily basis had to be immediately translated to the production and the finance side of the business. However, once the Kona brands moved into a distribution arrangement with Widmer Brothers and A-B, It was apparent that the Kona brands were focused on other regions, so I left and returned to the RAMP Group to work with the Blue Moon and Keoki Brewing brands. In 2007 I partnered with three others and purchased Kauai’s Keoki Brewing company from founder George Wells. In 2009 we merged the company with Mehana Brewing and moved everything to Hilo. At the time, I was firmly committed to becoming the dominant Hawaii brand and creating a beer company that had strong, vibrant local roots that the company could grow from. What were some of the major challenges in running a craft brewery in Hawaii? Biggest successes and failures at Hawaii Nui? We introduced a couple of great beers to the market – Hapa Brown Ale and Southern Cross, Belgian style Double-Red Ale. We didn’t capitalize on these great beers along with the existing equity in the Mehana beers to move the company forward in a positive manner. What went wrong at Hawaii Nui and lead to the bankruptcy and subsequent sale? The combined partnership did not have a singular vision for the company/brands. This led to the company being woefully under-capitalized in terms of capital resources and ownership sweat equity. The fact that the partnership took two years to address a major equipment failure is testament to this. Once we were able to replace the bottling line we had dug ourselves such a huge financial hole that we couldn’t get out of it. I took over the day-to-day operations on June 1 2012 and found myself with no sellable inventory, no credit, no cash and no raw materials. It was only by working with the remaining partners, employees, distributor and retail customers that we were able to sustain the company for another nine months. I do have to say that many of the business partners that I have had for my entire business career did their best to make it work. However, if you don’t have a vision and plan to execute that vision that the all the owners agree on and support, the capital won’t be there to finance it. Very simple really…..it’s a shame. Are you still involved with Hawaii Nui? Once the bankruptcy has closed we will dissolve the partnership. The new owners of the brands and equipment have their plans and their direction that they want to pursue. What’s next for you? Will you still be involved in the beer industry? Beer marketing is all that I have ever done….so absolutely I’ll still be involved. I recently joined the management team of Aloha Beer Company and I will be overseeing the re-launch of the brand and company. We are utilizing a different business model from my previous tenure and I believe this will set the company and the consumer up for success with a great local beer company. The ownership has an unwavering vision for growth and success and they are tasking me to execute a plan to achieve that vision. For my professional growth this is an exciting venture. 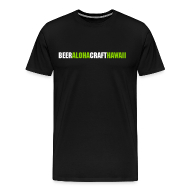 Look for new styles of beer being packaged under the Aloha Beer Company label and a new Honolulu based production facility being announced very soon. Tell me about The Ramp Group and your weekly beer events at Bar 35? Any changes planned for those events? The RAMP Group started producing beer tasting events back in 2004 with the “Hops and Grinds” at the Willows. This led to paired beer dinners at various restaurants and the “House of Brews” at Bar 35 which I have been hosting since 2006. We also host the “Brewers Table” Beer Dinner series at Brasserie Du Vin monthly. Where do you see the craft beer industry in Hawaii headed in the next 5 years? A lot more styles and a lot more local offerings – so the consumer is going to be the winner in this. However, a word of caution to the local producers. Everybody thinks it’s cool to run a beer company in Hawaii. The economics of the market are stacked against the local producer. In 1991 I could walk into Safeway on Pali and buy a 6-pack of Anchor Steam for $9.99. Today craft brands operate in the $8.99 – 10.99 range. Great for the consumer but terrible for the craft operator. I think George H. W. Bush called this “Voodoo Economics in 1980. Those of us who choose to live in Hawaii and make it our home have to make tough economic choices every day. Beer pricing has little or no elasticity in this market. However, since we are a transient market (new consumers every week) resident consumers will continue to benefit from this. Big, rich American IPA’s or British Strong Ale/Olde Ale styles – akin to a Barley Wine. 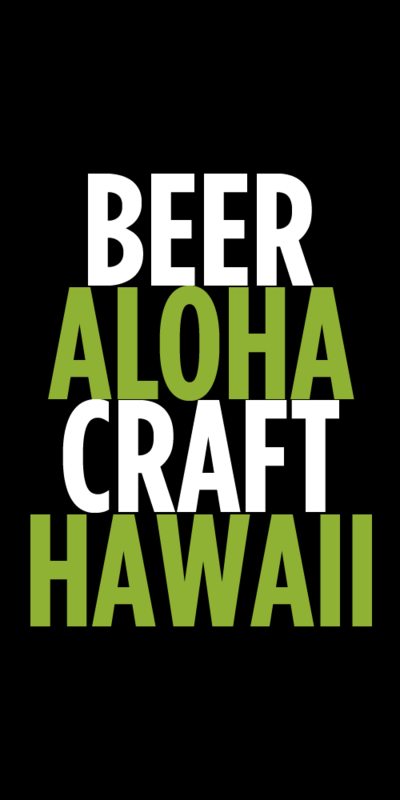 Since the previously mentioned styles are what I gravitate towards I am really looking forward to making sure the Aloha Beer Company has a style to fit my personal needs. We’ll be introducing a Red Ale in early summer and possible a big IPA later this year. We’re also working on a variety of classic beer styles being offered on draught. But since I am an unabashed beer marketer I can honestly say that my home refrigerator is full of Aloha Lager. Cheers! Tags: Aloha Beer, Aloha Brewing Company, Andy Baker, Hawaii Nui, Interview. Bookmark the permalink. Aloha Andy Baker. Mahalo for a great interview. You are a true Hawaiian craft beer visionary and enthusiast. It would appear that the Aloha Beer Company, great lager by the way, will continue on despite the restaurant location closure, to produce a red ale this summer possibly followed by an IPA. Is this separate from the new Hoku Brewing Company that we’ve heard about? The partnership that originally formed to start the Aloha Beer Company brand out of the old Sam Choy’s location has dissolved. Hoku Brewing will be going in there and the Aloha Beer Company will be announcing plans for a new local production facility shortly. These will be two separate companies with separate ownership. Will Dave Campbell be involved with either of these two breweries? Please disregard my post that follows below. I found the answer to my question by googling “Hoku Brewing” and checking out their site: http://hokubrewingco.com/. Looks like Dave Campbell is brewmaster for Hoku. Personally, I’m glad to know that the guy who brewed all those beers at that location is gonna be able to get back to brewing there. Awesome! A great guy, and a great friend. Can’t wait to try the new beers coming out of Aloha!